Brazil superstar Neymar was seen congratulating Manchester United‘s new signing Fred during the national side’s practice session. The Brazilian skipper gave Fred a hug before they took to the field. 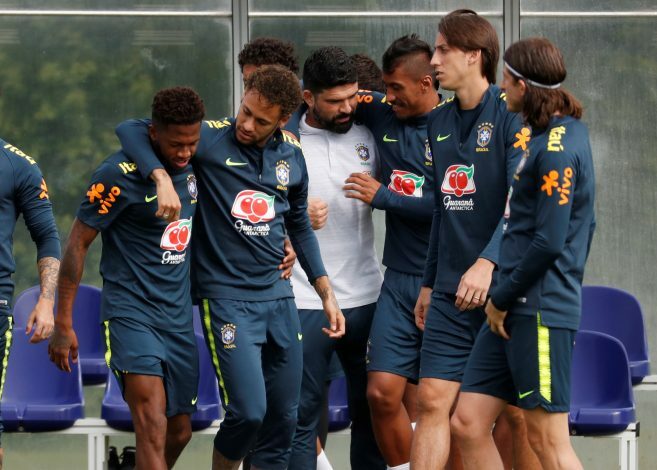 It wasn’t just Neymar, as Atletico Madrid left-back Felipe Luis and Barcelona midfielder Paulinho were also seen greeting the 25-year-old midfielder, who joined the Premier League giants from Shakhtar Donetsk. The club will be revealing further details about their new signing, who underwent a medical at Old Trafford. Neymar, who made a return to football after breaking his foot in February this year, scored a screamer against Croatia in the side’s 2-0 friendly win at Anfield. Neymar will hope Fred’s move to United will boost the player’s morale, and help him shine in the upcoming 2018 FIFA World Cup in Russia. Fred is really excited to join the Mancunian club after having being Jose Mourinho’s prime target for quite a while. The big money move has got a lot of excitement around, including the Brazilian camp. Meanwhile, Neymar himself is surrounded with transfer speculation, as many reports claim that the Paris Saint-Germain player is looking for a move to Real Madrid. Fred is being touted as the perfect replacement for Michael Carrick, and is expected to play a key role in midfield alongside Nemanja Matic and Paul Pogba. His former Shakhtar boss Mircea Lucescu too went on to congratulate him on his move, and the current Turkey manager has backed the talented player to be a success in the Premier League. At the moment, everything seems to be going good for the player, and it remains to be seen how he comes in and makes an impact.